Rosemary Clooney (May 23, 1928 - June 29, 2002) was an American singer and actress. She was born in Maysville, Kentucky. She became known with her song "Come On-a My House". She starred in many movies. She was diagnosed with bipolar disorder and died of lung cancer in Beverly Hills, California. Her brother is television presenter Nick Clooney (born 1934). His nephew was actor George Clooney and was the mother of actor Miguel Ferrer. ↑ Severo, Richard (1 July 2012). 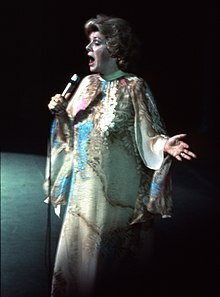 "Rosemary Clooney, Legendary Pop Singer, Dies at 74". The New York Times. Retrieved 31 December 2012.